The story of Steve Schwarzman, Blackstone, and a financial revolution, King of Capital is the greatest untold success story on Wall Street. In King of Capital, David Carey and John Morris show how Blackstone (and other private equity firms) transformed themselves from gamblers, hostile-takeover artists, and ‘barbarians at the gate’ into disciplined, risk-conscious investors while the financial establishment—banks and investment bankers such as Citigroup, Bear Stearns, Lehman, UBS, Goldman Sachs, Merrill Lynch, Morgan Stanley—were recklessly assuming risks, leveraging up to astronomical levels and driving the economy to the brink of disaster. Now, not only have Blackstone and a small coterie of competitors wrested control of corporations around the globe, but they have emerged as a major force on Wall Street, challenging the likes of Goldman Sachs and Morgan Stanley for dominance. 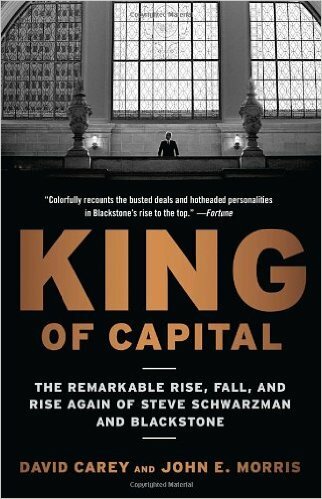 Insightful and hard-hitting, filled with never-before-revealed details about the workings of a heretofore secretive company that was the personal fiefdom of Schwarzman and Peter Peterson, King of Capital shows how Blackstone and private equity will drive the economy and provide a model for how financing will work in the years to come.